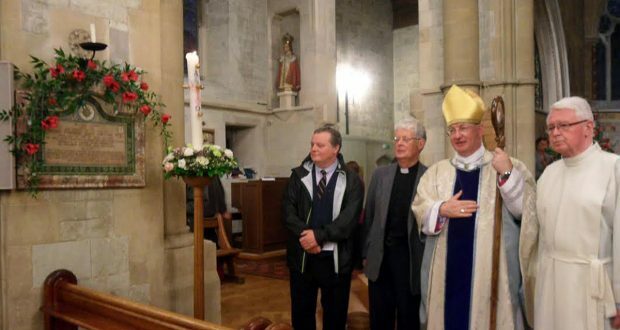 A memorial mass took place on Sunday 11 October 2015 at the Sacred Heart parish in Caterham, Surrey, to commemorate the centenary of the death of Irish Jesuit Fr. 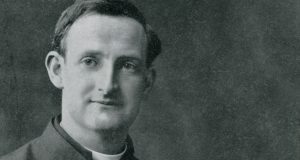 John Gwynn, who was Chaplain to the Irish Guards and who served in France during the First World War. 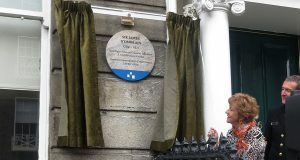 Many knew him as a powerful and eloquent preacher at the Sacred Heart Church and at St. Francis Xavier’s Church in Dublin, where questions of sociology had a strong attraction for him. Fergus O’Donoghue SJ who represented the Irish province at the event said, “I was very glad that myself and Brother Michael O’Connor (former Royal Marine and British Jesuit) had gone because the local parish people had made such an effort, and there was a display on John Gwynn’s life, and generally it was just great.” A memorial plaque was erected in the Church by the Irish Guards who were based at Caterham barracks nearby. 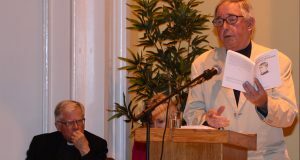 Bishop Richard Moth, the bishop of the diocese and former bishop to the Armed Forces, noted the enthusiasm of the Sacred Heart parish and presided over the special mass on Sunday evening. “It was by chance that an article of Fr. Gwynn was seen online by his grandniece from Massachusetts,” says Fr. Fergus. “She got in touch and sent a message. 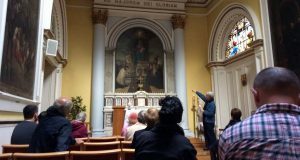 It was lovely because the whole parish got involved.” The mass itself featured the song We Remember You by children from St. Francis’ School as well as the recessional hymn Be Thou My Vision, based on St. Patrick’s Breastplate. Lord Desmond Fitzgerald, the Captain of the 1st Irish Guards has written: “It is certainly no exaggeration to say that Fr Gwynn was loved by every officer, N.C.O. and man in the battalion.” Furthermore, an Irish Guard who was also an Old Belvederian spoke of the Jesuit’s presence at the Medical Officer’s dugout so that he could be near his injured men, and that he organised sports and concerts to keep up morale. He even returned to the battlefield despite being crippled after a shell wounded him. John Gwynn SJ experienced internal suffering during his lifetime. “It’s quite clear that he had a condition like bipolar disorder (a mental illness characterised by extreme high and low moods), then known as suffering from nerves,” says Fr. O’Donoghue. Through all of this, he was extremely brave and he was an enormously successful chaplain. Fr. Gwynn was fatally wounded in action near Vermelles, Northern France on 11 October 1915 and he died the next day at 50 years old. It was said that he would have been happy to die as a ‘soldier of God’.